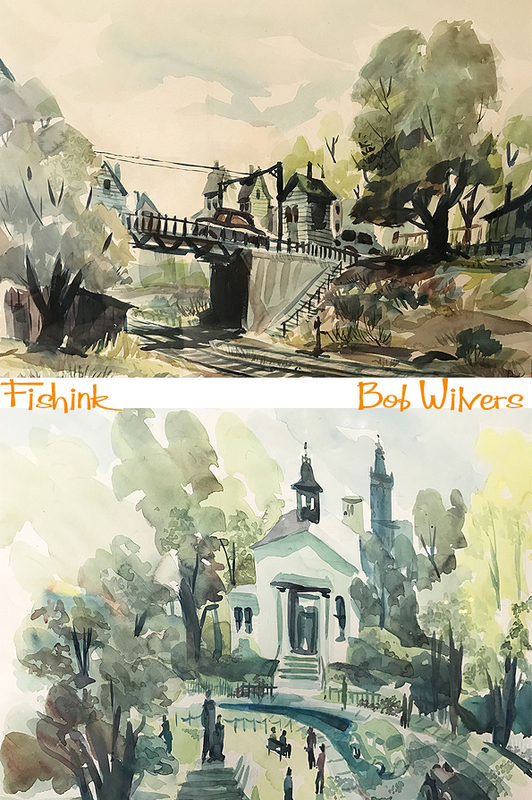 I’ve recently added to my old post on the artist Bob Wilvers from the 1960’s, so for those of you who didn’t follow me back in 2011, here’s a complete update. Enjoy ! Bob Wilvers was the art director for the Carl Ally agency in the early 1960’s when he developed a campaign for Salada Tea. The commercial featured little old ladies on large Harley-Davidson motorcycles and the tag line ….. ”Who says that Salada Tea is for little old ladies?” There’s a link to a poor copy of the original ad here and another 3 amusing Salada Tea ads here. In 1964, he became a founding partner and co-creative director at Jack Tinker & Partners, with a client roster that included Coca-Cola, Gillette and Alka-Seltzer Plus. 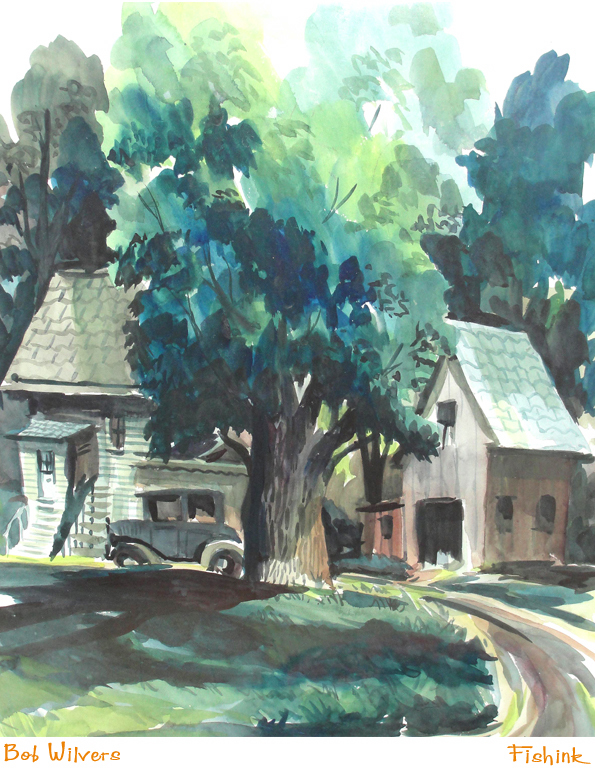 He was an accomplished watercolor painter and illustrator whose work was featured in several galleries and museums. 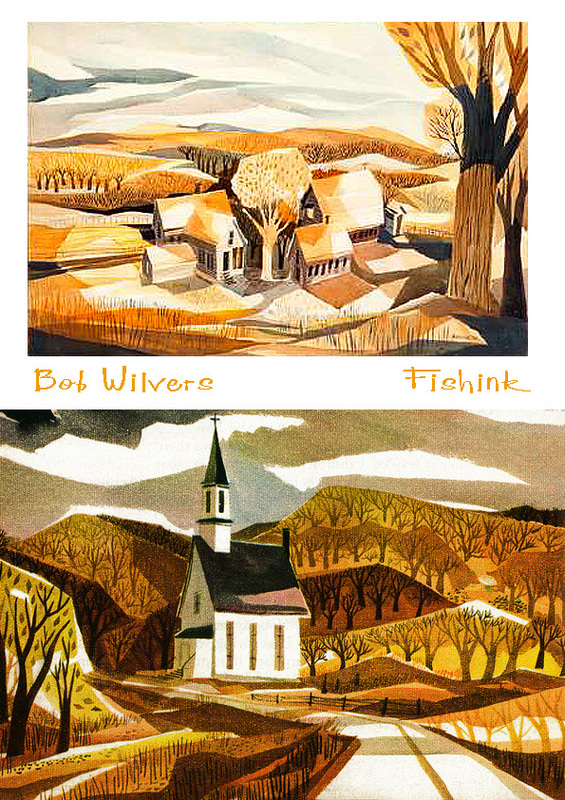 Apparently Milwaukee based Wilvers was just 24 when he painted these. 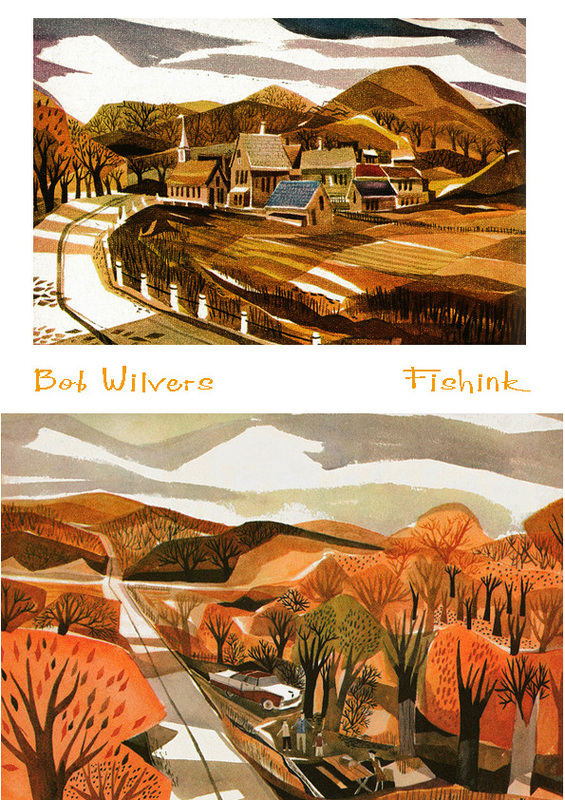 I received an email from Terry who had read my blog about the illustrator Bob Wilvers and for those of you who missed it (tut tut) you can catch up here. At the end of the article I asked if anyone knew of any more of Bob’s work could they let me know. Terry not only knew of his work, but had an illustration of his own and even sent a copy so that I could show you all. Terry explains ” I found this WC in a very rural part of Indiana and it reminds me of an area in West Allis, Milwaukee which was a district of homes which were bars/pubs on the first floor, and homes/apartments above on second/third floors. The signature looks a little like “williams” but on the back printed in pencil was Bob Wilvers on an entry form to an art exhibit in Milwaukee, so I assume this was painted well before he moved to NYC. Bob thumb-tacked the paper to a board, you can see 6 white holes around the edges where the water flowed around.” Such wonderful work, again with such spirit and so well observed. 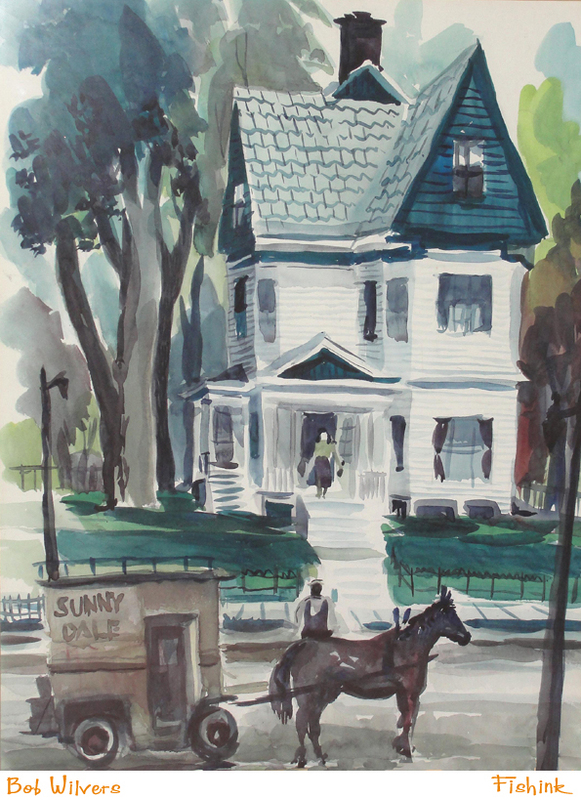 I’m so grateful to Terry for sharing this beautiful piece of Wilmers’ art with us, thanks again Terry. For those of you who are still following me, regarding the story of Bob Wilvers, there is yet a further addition and a surprising happy ending. After a reader of my blog sent me an image he had of Bobs’ work, I was suddenly gripped with an urge to see if there was indeed more images to be discovered. I was lucky to be able to track down Bobs’ daughters Roberta and Tracy, and they very kindly sent me some images of the pieces of their fathers’ work, that they had in their homes. Such beautiful work should be shared with many and I hope that by blogging here, we can all appreciate what an amazingly skilled artist he was. I love the summery feel to his watercolours above and perhaps later images below where Bobs’ style has developed and flourished into new areas. 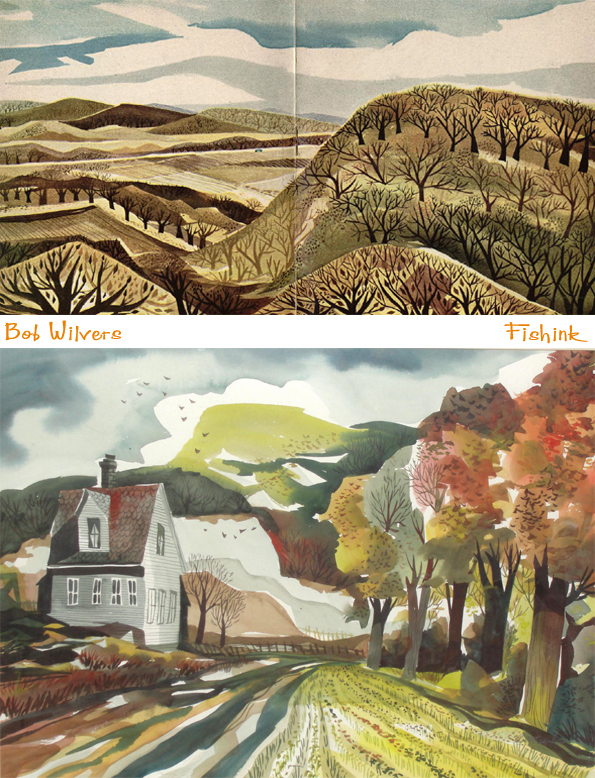 My favourites however are still his beautiful landscapes, with their rich colours and textures. Sincere thanks again to both Roberta and Tracy for kindly allowing us access to the images above. Amazingly, I’ve just managed to find an online copy of the Ford Times magazine October 1956 for sale, which features some of Bobs’ work. So a little piece of Mr Wilvers will live in my home too. 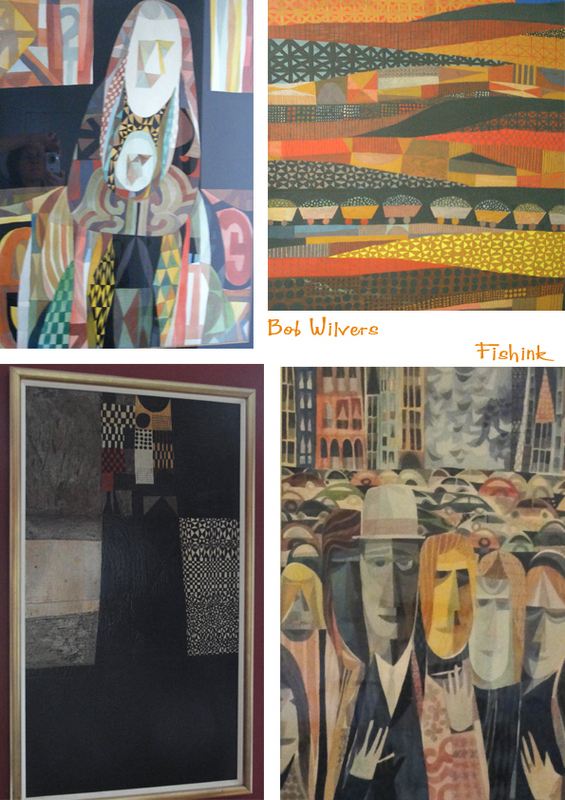 Also many thanks to Marilyn for sending this image of two paintings of Bob’s that she saw an antique show approx 10-12 years ago in the booth of W M Schwind Jr Antiques of Yarmouth, ME. They were marked $3500 each. Finally this week a reader called Richard contacted me with these two wonderful pieces. Apparently, Richard’s father told him that Bob painted these in his eighth grade, they have been hanging on his living room wall since he was a child. How lucky ! Thanks Richard for getting in touch and sharing those with us, much appreciated. 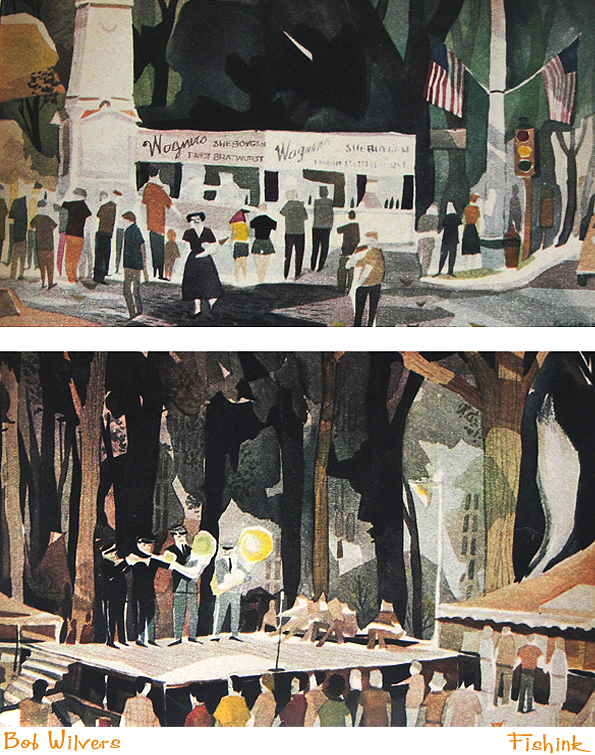 If anyone has any links to more of Bob’s beautiful illustrations could they please let me know. 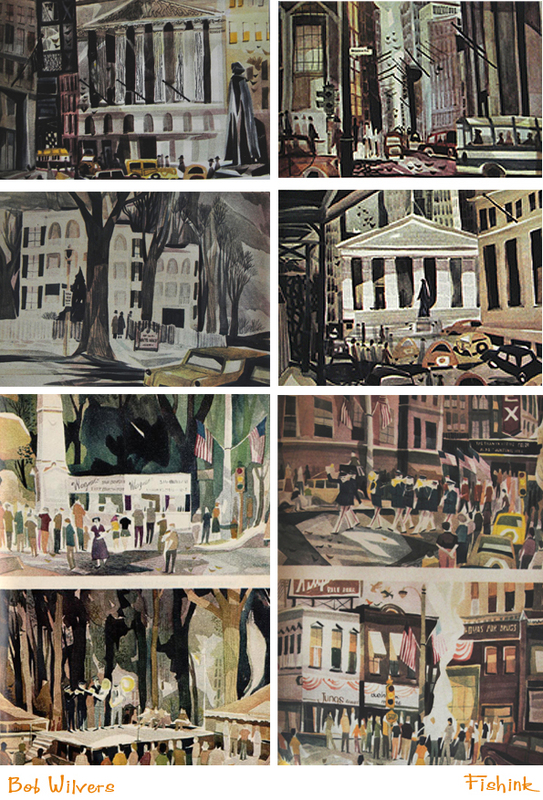 Love the deceptive simplicity of his water colours: they capture so much with so few brush strokes. 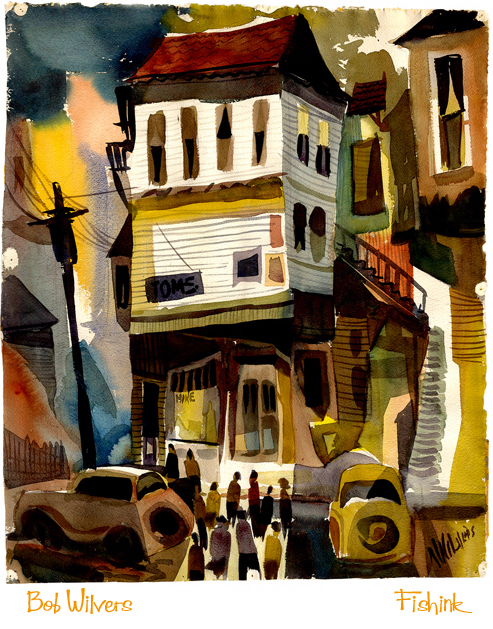 Thanks Wallace for your comment, it’s so true, his work evokes such emotion with simple brush strokes. Not an easy feat ! These are beautiful. The one that caught my eye was of the car pulled off to the side of the road and the family having a picnic. Reminds me of my family traveling across the country in the late 1950’s and stopping at a roadside ‘rest area’ for a bite to eat. No McDonald’s back then or other fast-food joints, one had to pack their own food. I love the vibrant, strong colors in the thumb-tacked print. Just an excellent post, Craig. Many thanks go to all who contributed.